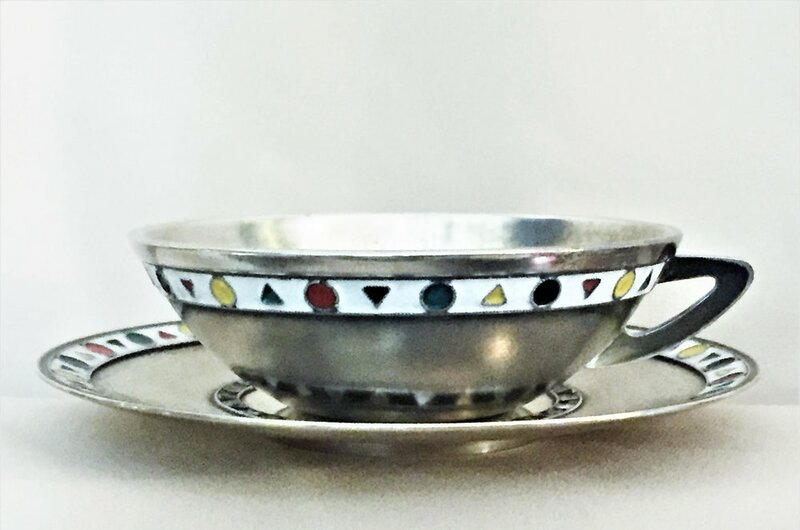 Fully hallmarked, this elegant Mid-Century Modern set of eight coffee cups with saucers of unusual shape was made in the USSR in the 1960s out of 916° silver and decorated with a minimalistic geometric pattern of multi-colored enamel. In perfect condition, never been used, like brand-new. Probably Dutch. 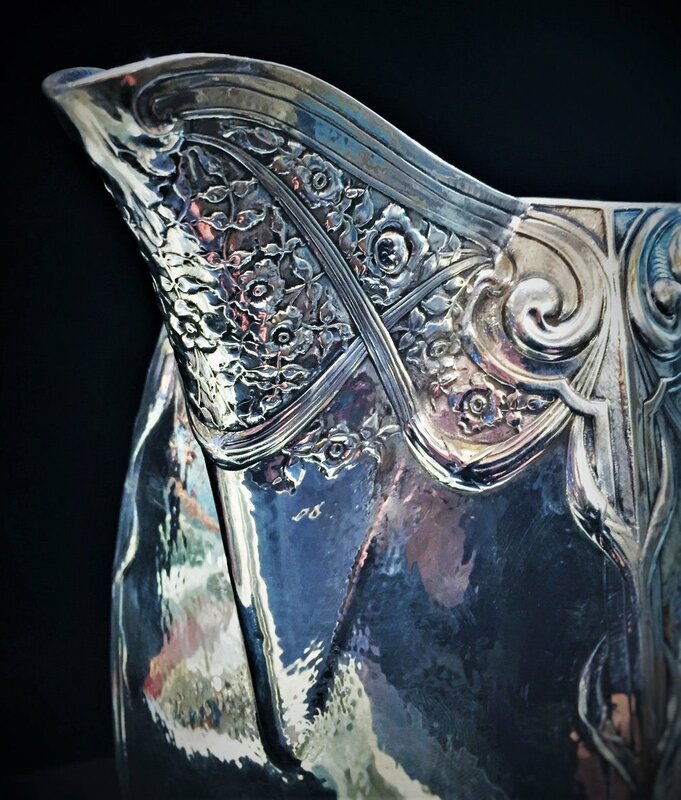 Lavishly designed in the style of Arts & Crafts / Art Nouveau, this outstanding hand-made, hammered silver-plated water pitcher was obviously crafted by a highly skilled silversmith. 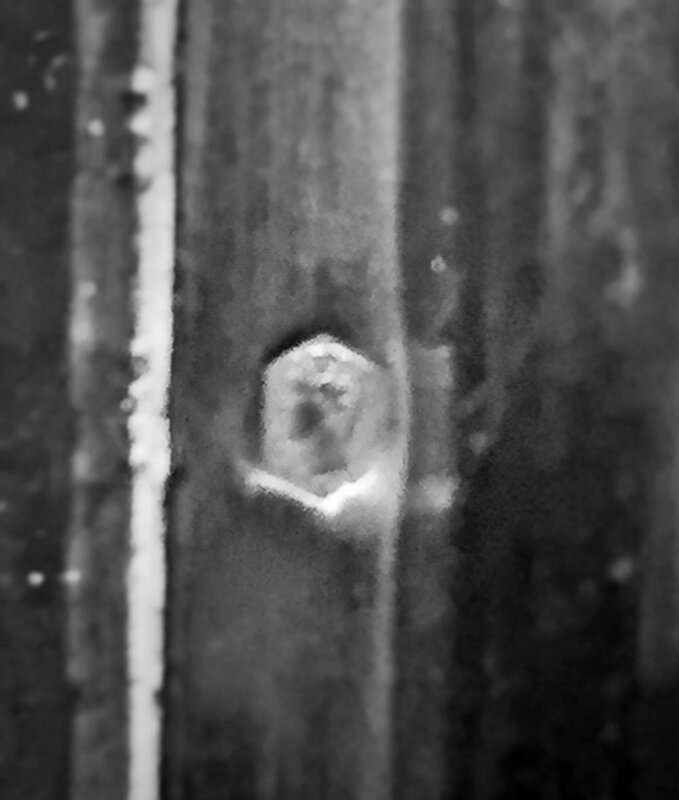 The hallmark on the bottom looks like a mill, surrounded by two smoking pipes on both sides facing opposite directions. There is also a (model) number - 3030. Excellent original condition with no dents, scratches or monograms. All the details are clear, with no removals, repairs or alterations. The pitcher has the soft, warm, original finish, with no buffing or machine polishing. The Arts and Crafts movement emerged during the late Victorian period in England, the most industrialized country in the world at that time. Anxieties about industrial life fueled a positive revaluation of handcraftsmanship and pre-capitalist forms of culture and society. Arts and Crafts designers sought to improve standards of decorative design, believed to be debased by mechanization; and to create environments, in which beautiful and fine workmanship governed. The Arts and Crafts movement did not promote a particular style, but it did advocate reform as part of its philosophy and instigated a critique of industrial labor; as modern machines replaced workers, Arts and Crafts proponents called for an end to the division of labor and advanced the designer as artisan. 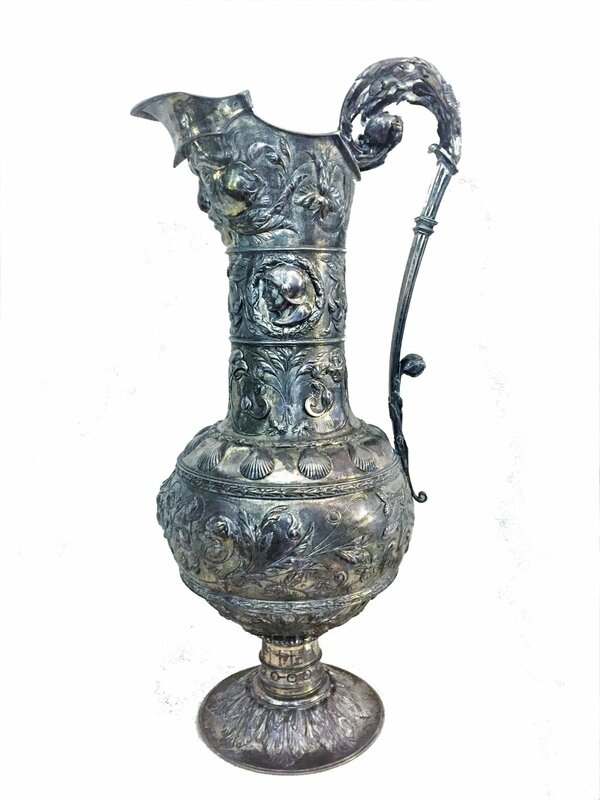 This amazing silver wine jug in perfect German Baroque style of the 17th Century was actually finely crafted in the repoussé and chasing techniques at the end of 19th Century. 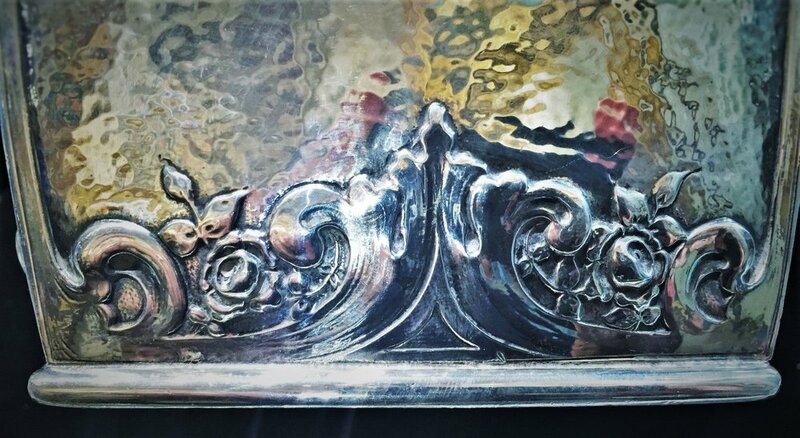 Though unmarked, clearly it is a work of a master silversmith. The mouth of the jug, fitted with hinged lid made in the shape of the head of an ancient knight in a helmet with a raised visor. The elegant long neck decorated with two medallions with profile portrait images of a knight in helmet and, in all likelihood, the lady of his heart. The spherical part of the jug decorated with allegorical images from ancient German legends in the form of snakelike monsters with human heads. 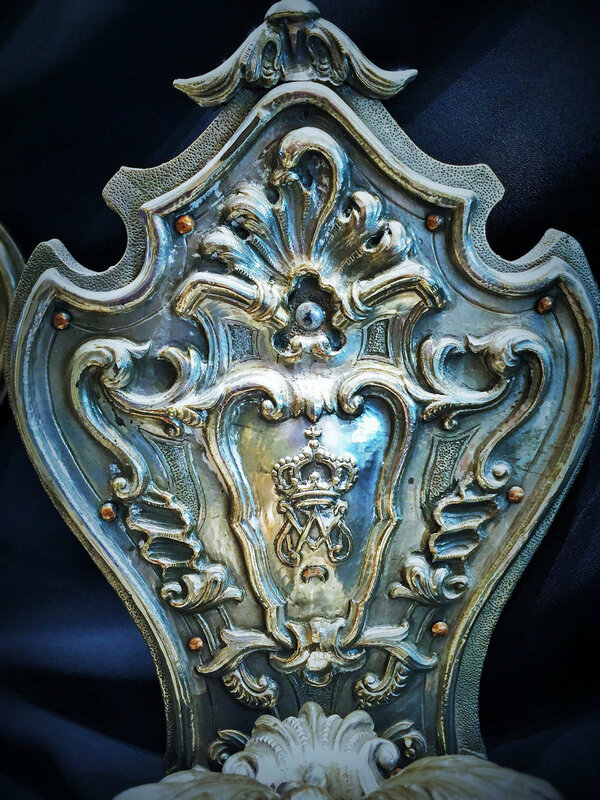 The beautiful, forked at the top end handle of the jug embellished with bay leaves, a symbol of victory. 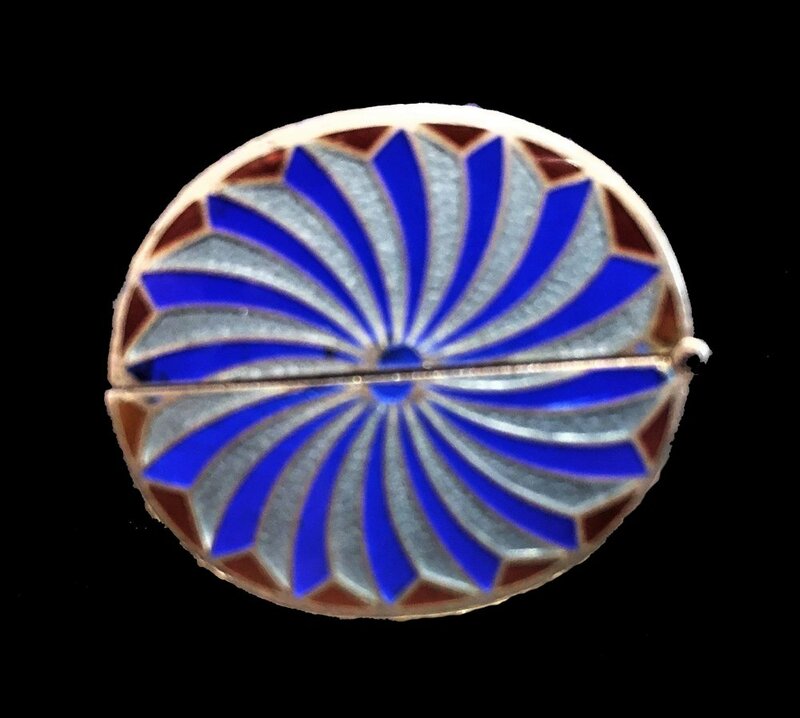 This most unusually designed Edwardian era snuffbox of elongated oval-cylindrical form is beautifully handcrafted of sterling silver, multicolor guilloche enamel, with gilt interior. Hallmarked with “STERLING” and two Mikhail Krikheli private stamps. Rare and unique, this sterling silver, enamel and gilt snuffbox, decorated with mushrooms was commissioned in a single copy by the known New York City art collector, antiquarian and gallerist, Mikhail Krikheli. Excellent condition. There is no damage or repairs. 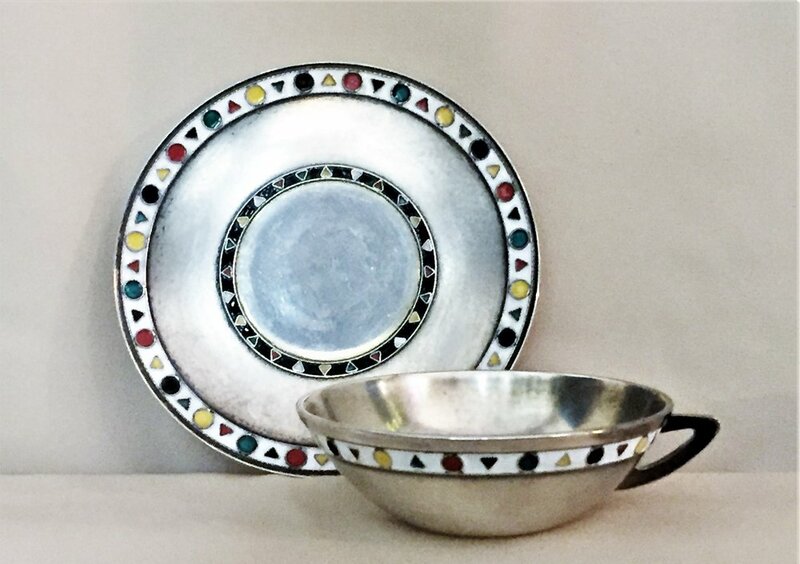 The set consists of two serving dishes and four individual dishes, all with pierced handles. Excellent antique condition, consistent with age and use. Individual dish dimensions: Length 6 inches Width 4.5 inches Height 0.75 inches. Combined weight: 12.5 troy ounces. H 12 in. x W 6 in. x D 6 in. Made in Paris by Maison Odiot circa 1900, this .950 silver-gilt mounted rock crystal claret jug is an extraordinary example of the unique skills of their artisans. What makes it extraordinary is the outstanding design and composition, where the rock crystal swirled cutting lines are smoothly becoming those of the stylized seaweed foliage scrolls on the silver mounting throughout the neck, mouth, and foot. The top of the lid decorated with a seashell. Strikingly elegant in its brevity and simplicity, this solid sterling silver oval entrée dish by Cartier, ca. 1950’s, is fully hallmarked and weighs 64oz. This fine work of a silversmith art was made during the era of Pavel Sazikov, the original establisher of the firm, which makes it especially valuable and important for the collectors of the Russian Imperial silver objects and applied arts. The straight sided rectangular box minimalist design is striking, especially given the time of manufacture, and the perfect rendering. The most noteworthy element of this unique design is the pool on top of the lid, in the form of a simple ring on the loop. 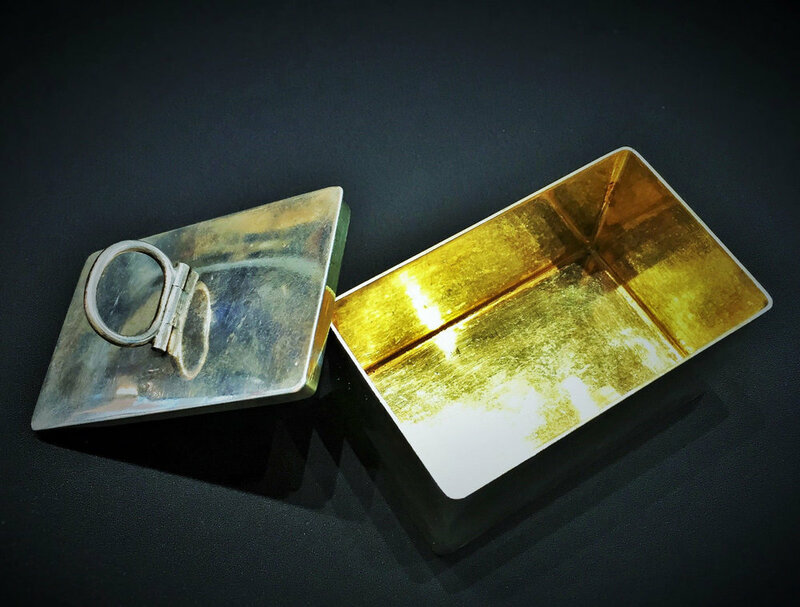 Another big surprise is that when the lid is removed, the interior of the box and the inside of the lid are richly gilded, powerfully contrasting with the simplicity of the overall design. After Ignatti’s passing in 1868, his three son continued to run the business in Saint Petersburg, until that branch was closed in 1877. The Moscow branch continued for another ten years before it was taken over by another firm. Concise in form, this gorgeous French hand-cut crystal flower vase framed in sterling silver is an unusual design-crossover between Classism and High Art Deco styles. Will fit ideally into a modern interior space, as well. 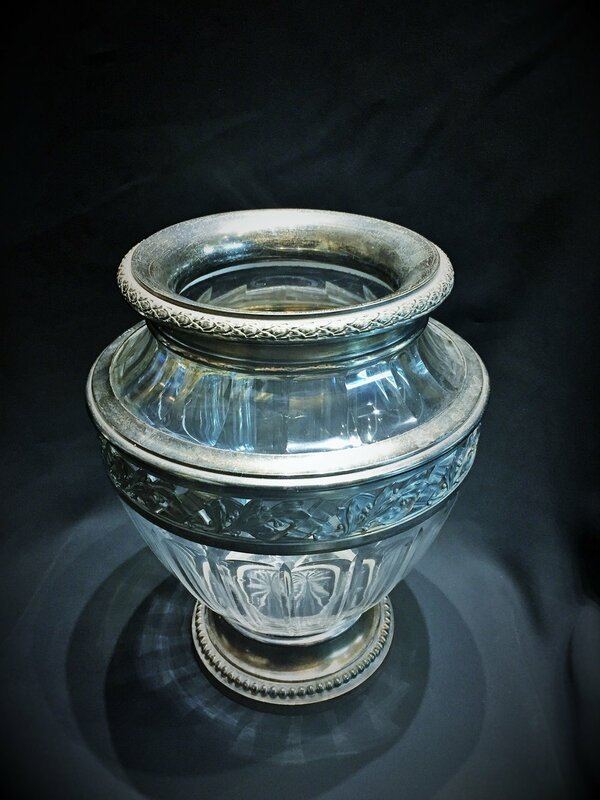 The vase is in perfect vintage condition - no chips, scratches, imperfections, restorations. Fully hallmarked. 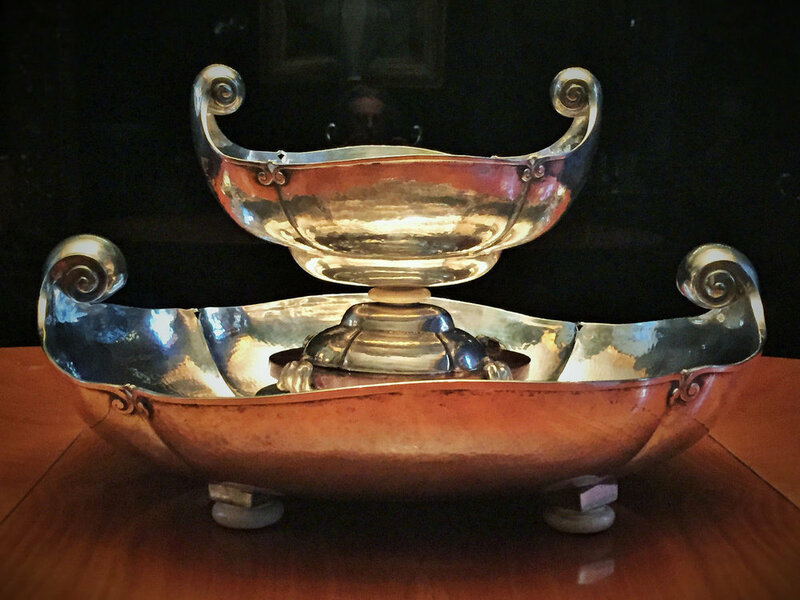 - The smaller footed bowl is raised on oval wood platformб resting on seated cast silver male figures. - The larger bowl is raised on flattened bun feet. - Both, the larger and smaller bowls have scrolled handles, lobed bodies and banded rim that ends in scrolls at the fluted seams. This magnificent formal centerpiece was created around 1940 in Milan by S.A. Calderoni, a famous Italian firm of fine jewelers and silversmiths that was established in 1898 and achieved its greatest fame during Art Nouveau, Art Deco and Novecento periods. The company also manufactured items for special private orders and commissions and was a supplier to the court of the last Italian King, Victor Emmanuel III. The outstanding artistic design in the style of Novecento and its generous proportions combined with a remarkable handmade rendering make this magnificent centerpiece not simply a functional object but a true masterpiece of applied arts. 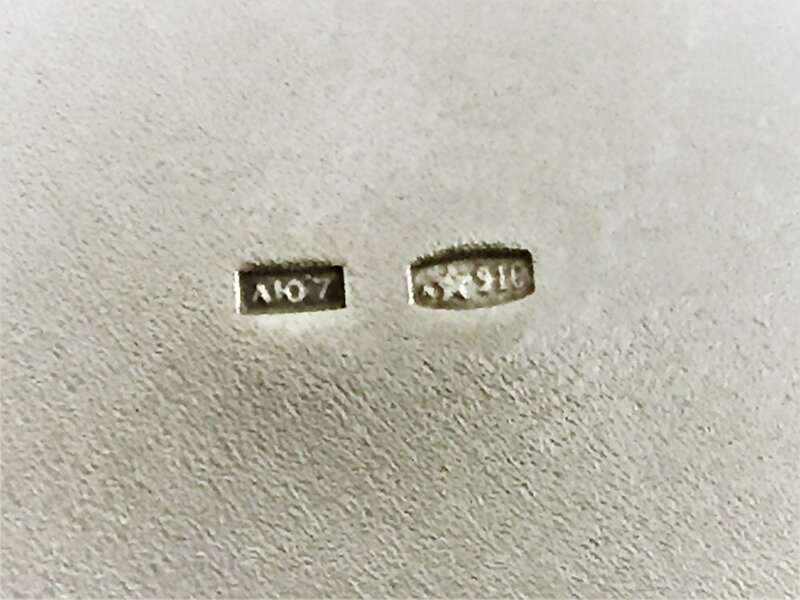 Niello is black metallic alloy of sulfur with silver, copper, or lead that is used to fill designs that have been engraved on the surface of a metal (usually silver) object. Niello is made by fusing together silver, copper, and lead and then mixing the molten alloy with sulfur. The resulting black-colored sulfides are powdered, and after the engraved metal, usually silver, has been moistened with a flux, some of the powder is spread on it and the metal strongly heated; the niello melts and runs into the engraved channels. 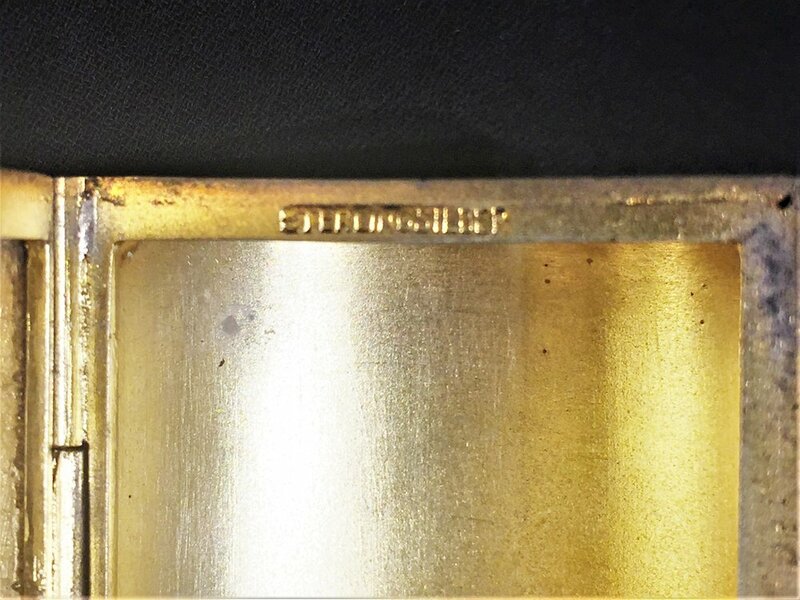 The excess niello is then removed by scraping until the filled channels are clearly visible, and finally the surface is polished. The contrast of the black niello against the bright silver surface produces an attractive decorative effect. Inhaling snuff, or snuffing, as it is also called, was first witnessed by a European in 1493, when Friar Ramón Pane, who had arrived in the new world courtesy of Christopher Columbus, was living as a missionary among Haiti’s indigenous Taino. Until then, tobacco had been unknown to Europeans, but the use of tobacco spread like a weed on the continent during the 1500s. By the second half of the 17th century, ornate boxes were being produced to keep the precious powder dry. At the beginning of the 18th century, French jewelers began making snuff boxes out of silve and gold set with diamonds, amethysts, and sapphires. By 1740, specialized artisans took over the production of these ornate tabatières, which they engraved, chased, and enameled. A close cousin of the tabatière was the tabatière à cage, whose sides, tops, and bottoms featured gold or metal frames holding panels of decorated ivory, agate, tortoiseshell, or porcelain. The shapes of these boxes was not limited to simple rectangles. Porcelain containers resembling trunks were common, as were ovals, but tabatières shaped like shells were more rare. And while materials were often enough for their decoration, sometimes these snuff boxes were hand painted, depicting everything from miniature landscapes and bucolic scenes to tiny portraits or grisaille cameos of their owners. Presented here is a rare 19th Century German "Bruderschaft" (Brotherhood) Wine Vessel in form of a wine barrel, consisting of two separate cups, connected by a chain with a lock. With gilded interior, this unique object is beautifully crafted in Tromp L'oeil technique, masterfully simulating natural pattern of wood and metal hoops. There is an inscription around one end that reads "Nur fur Wein soll dieses Fassgeschaffen sein" ("Only for wine these barrels are created"). On the other end, there is an undecipheredcrest, depicted as a furious lion on its hind legs, wearing a crown and roaring with his tongue out. Trompe-l'œil (French for "deceive the eye") is an art technique that uses realistic imagery to create the optical illusion that the depicted objects exist in three dimensions. Forced perspective is a comparable illusion in architecture. Presented here is a superb gilded silver and stripped cloisonné blue enamel antique tea glass holder, an indispensable attribute of the Art Nouveau era. There is an illegible hallmark on the bottom (probably, Austrian). 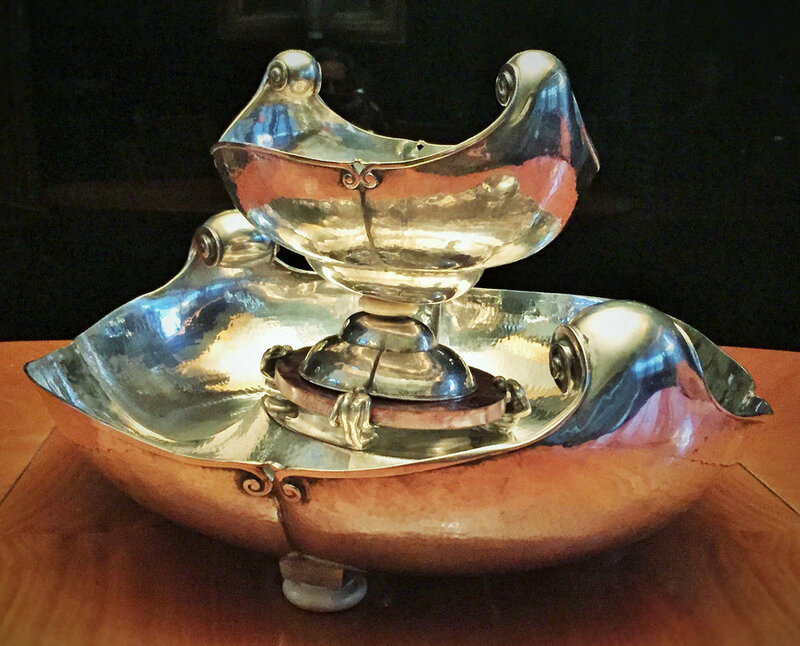 Probably German, though unmarked, this magnificent Jugenstil silver-plated & hand-cut crystal liner centerpiece was made circa 1900 - 1915 and features a very attractive geometric design, typical for German Art Nouveau movement . 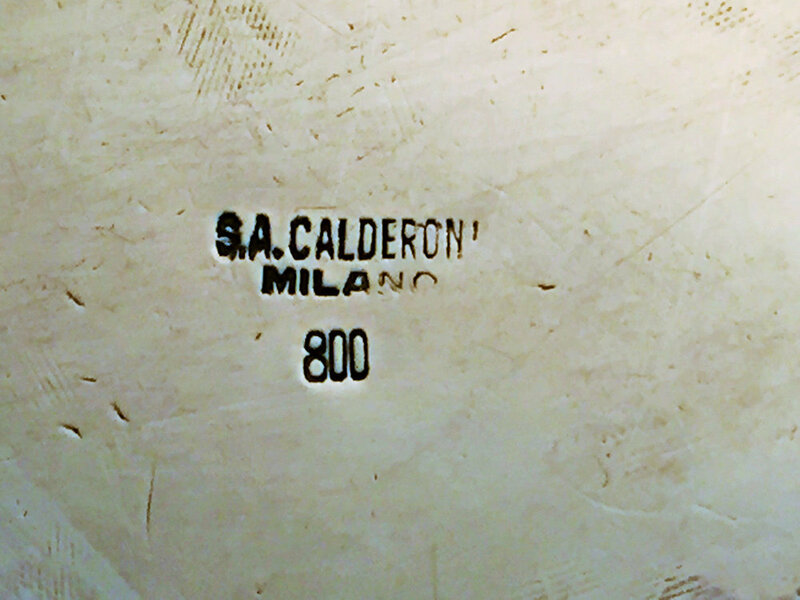 Though unmarked, it is clearly in the style of the well-known WMF Company. 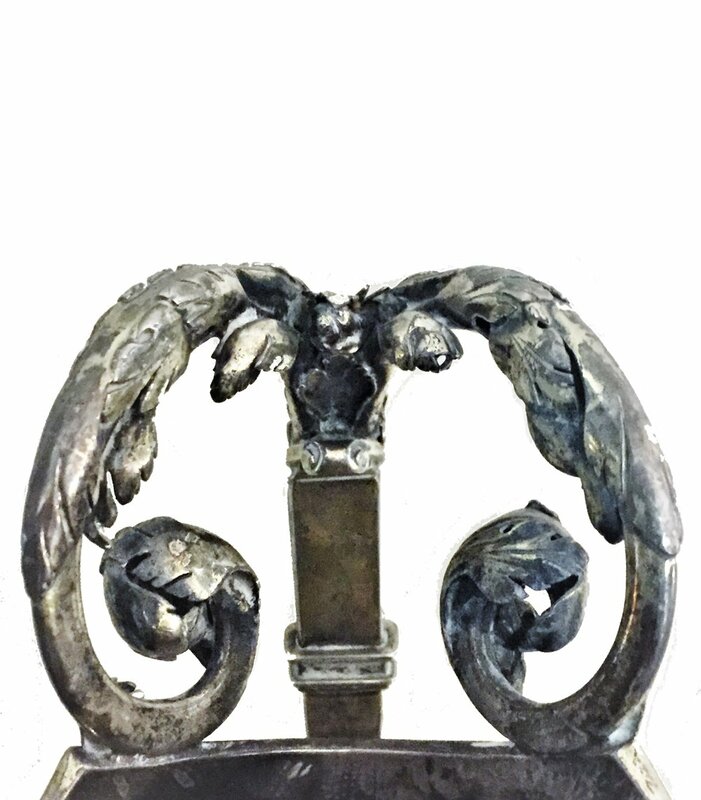 The high quality metalwork is in perfect original condition, as well as the original finely hand-cut crystal liner. Please refer to photographs, as they are part of the description. Danish handmade and lightly hammered sugar bowl with ebony handles and beaded sockets by George Jensen Silversmiths of Copenhagen, Denmark was produced in the period of 1935 - 1944 (Model: 80F). The soft, warm, original finish is present, with no buffing or machine polishing. 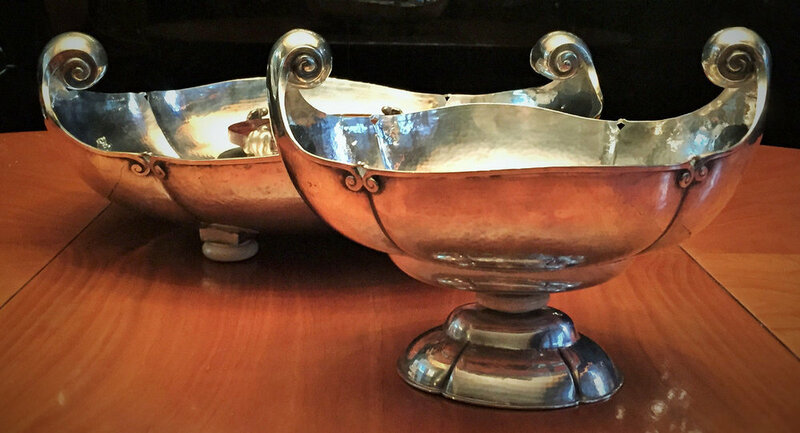 Georg Arthur Jensen (31 August 1866 in Rådvad – 2 October 1935 in Copenhagen) was a world-famous Danish silversmith. Born in 1866, Jensen was the son of a knife grinder in the town of Raadvad just to the north of Copenhagen. Jensen began his training in goldsmithing at the age of 14 in Copenhagen. His apprenticeship with the firm Guldsmed Andersen, ended in 1884, and this freed young Georg to follow his artistic interests. 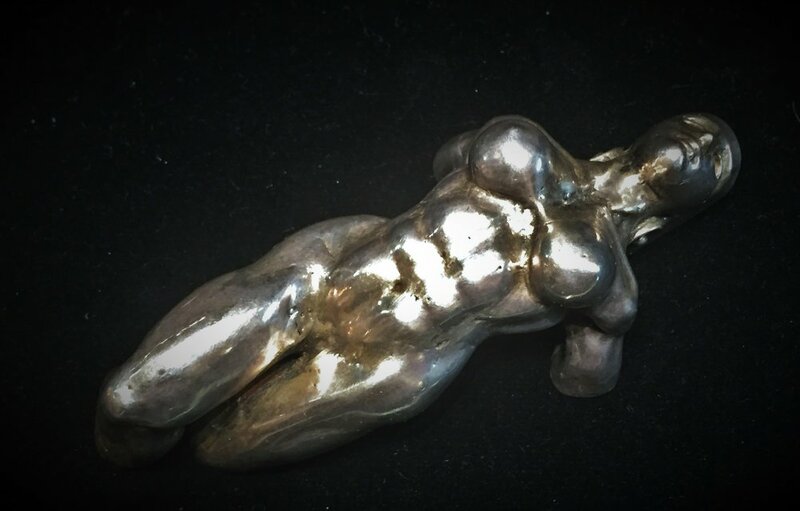 From childhood, Jensen had longed to be a sculptor and he now pursued this course of study at the Royal Academy of Fine Arts. He graduated in 1892 and began exhibiting his work. Although his clay sculpture was well received, making a living as a fine artist proved difficult and he turned his hand to the applied arts. First as a modeler at the Bing & Grøndahl porcelain factory and, beginning in 1898, with a small pottery workshop he founded in partnership with Christian Petersen. Again the work was well received, but sales were not strong enough to support Jensen, by this point a widower, and his two small sons. In 1901, he abandoned ceramics and began again as a silversmith and designer with the master, Mogens Ballin. 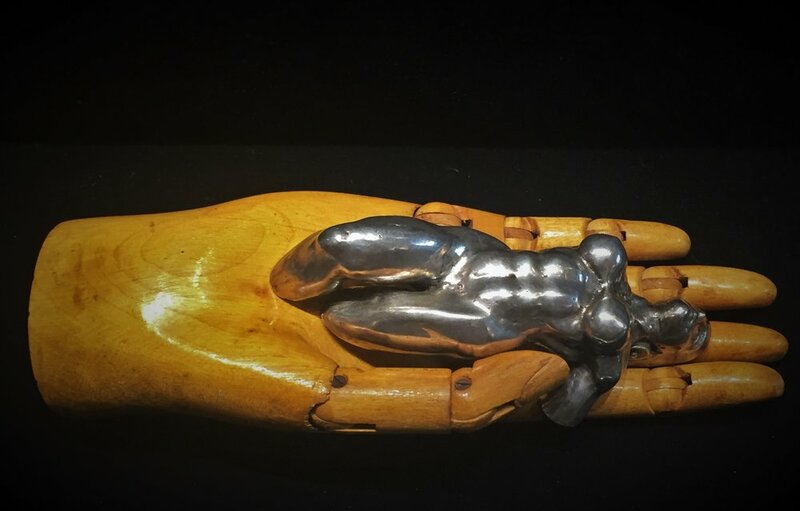 This led Jensen to make a landmark decision, when in 1904, he risked what small capital he had and opened his own little silversmith shop at 36 Bredgade in Copenhagen. 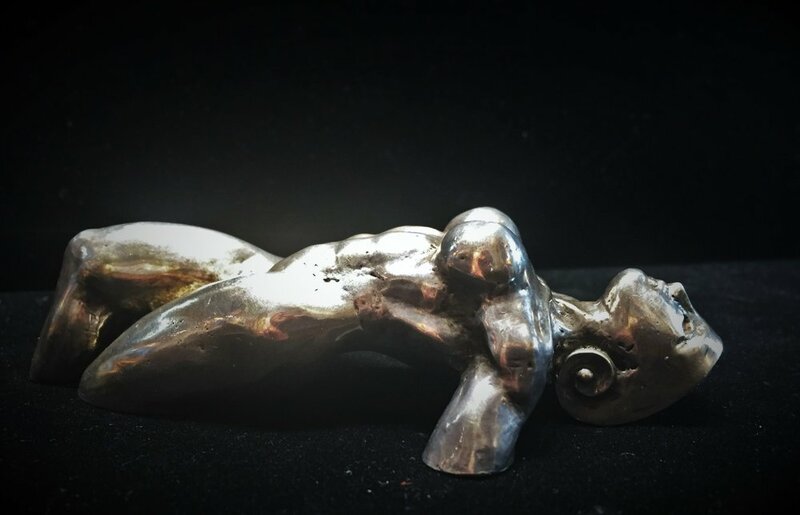 Jensen's training in metalsmithing along with his education in the fine arts allowed him to combine the two disciplines and revive the tradition of the artist craftsman. Soon, the beauty and quality of his Art Nouveau creations caught the eye of the public and his success was assured. The Copenhagen quarters were greatly expanded and before the end of the 1920s, Jensen had opened retail outlets as far ranging as New York, London, Paris, Stockholm, and Berlin. A beautiful and very elegant American Art Nouveau Sterling Silver Tea & Coffee Service, embellished throughout with high-relief floral motif and garlands. Produced by the Reed and Barton Company around 1900, it consists of 4 items - a round tray, coffee/tea pot, sugar bowl and creamer. 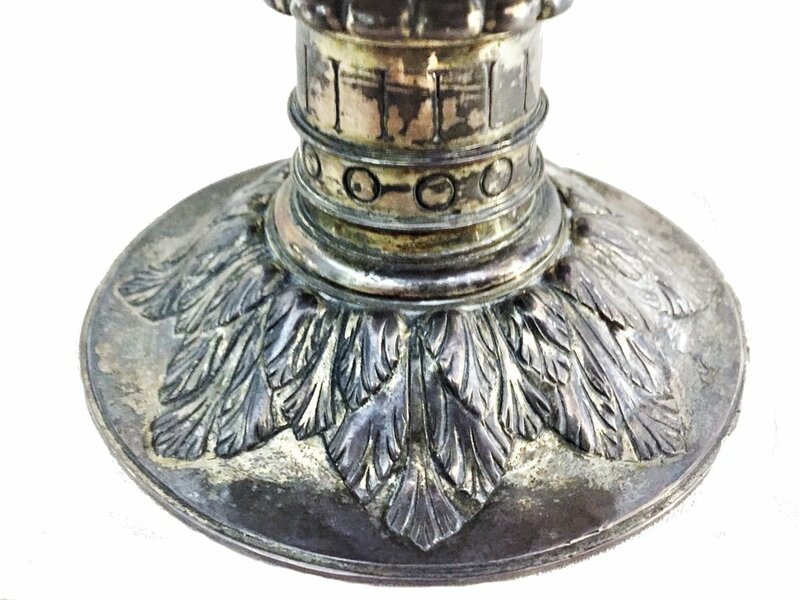 Though this service is over a hundred years old, it is in a perfect usable condition and will definitely be a worthy addition to your exquisite home. For more details, please refer to the photographs, as they are part of the description.